Proposal for NW Flanders approaching Broadway, looking west. One of the projects we’re most excited to follow this year is a complete remake of NW Flanders Street into a low-stress bikeway between Naito Parkway and NW 24th. 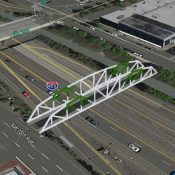 And yes, it will come with a new carfree bridge over I-405. We can hardly wait! Since there’s been significant progress on them recently, I figured it was time for a check-in. A continuous, (hopefully) high-quality, east-west bikeway that connects such a large number of housing units, jobs, and destinations has vast implications for our city. 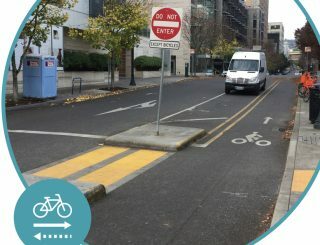 If we get it right, it could become a marquee project and serve as a blueprint for how Portland can move the needle on transportation and a whole host of other issues (public health, climate change, equity, community-building, air quality, affordability, economic development, and so on) that great cycling infrastructure intersects with. Flanders at Broadway, looking west. 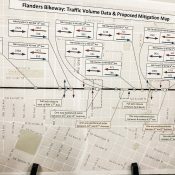 The NW Flanders Bikeway project launched last fall and PBOT has made considerable progress. It’ll probably be summer before the design and outreach process is complete, and construction isn’t slated until 2020; but proposals are out and things are beginning to take shape. Proposed traffic diversion elements east of I-405. 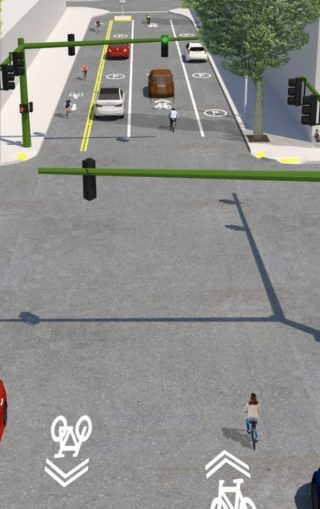 Between I-405 and Waterfront Park PBOT has proposed six sections where car drivers will be allowed to go only one-way. This “converging one-way” design is an attempt to divert auto users off of Flanders and/or discourage them from using it at all. 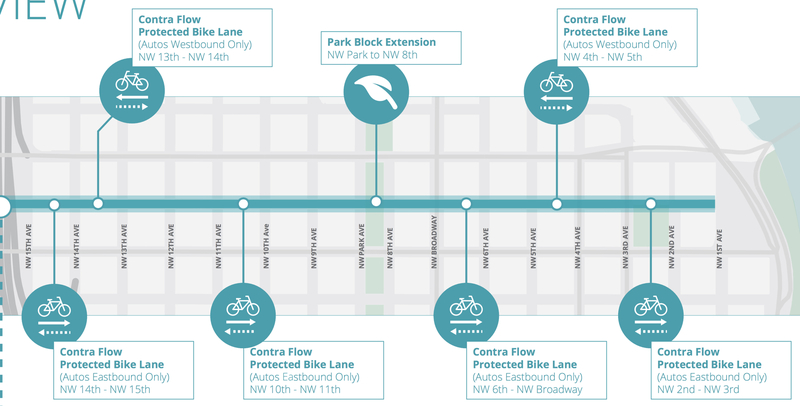 Where drivers will only have one direction of travel, the bikeway will be either shared (in same direction of auto travel) or via a protected “contra-flow” bike lane. This isn’t an entirely new design for PBOT. They’ve already installed one block of it on NW Marshall between 10th and 11th (right). These one-ways are in addition to the proposal to extend the North Park Blocks across the street between NW Park and 8th, which will create a dead-end for drivers. There would be another semi-diverter at 21st. This $6.4 million bridge will be the centerpiece of the bikeway. With construction slated for late 2019, it will hopefully be done around the same time as the bikeway. We’ve covered the bridge a lot in the past so see the archives for all the background. Today we want to share the most recent drawing and proposals. As you can see in the drawing above, bicycle users will be in the middle two lanes and walkers will use sidewalks on the edges. When we last wrote about the design the space was going to be split equally with four, six-foot wide lanes. The sidewalk will be separated by a mountable curb or some other material. 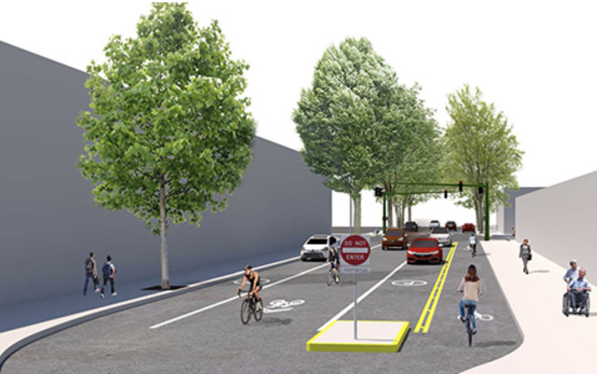 Because the bridge and its connections to the bikeway are located in such a dense street grid with freeway ramps and lanes nearby, PBOT has had to do quite a bit of wrangling with ODOT to come up with an acceptable plan. There are still operational issues to hammer out, but here are the other elements of the projects that PBOT is proposing to help make it it all fit together (an expanded view of the graphic above). This is all very exciting. Of course the plans could change depending on how the outreach process goes. Stay tuned for opportunities to weigh in. I wonder if they could also put a size limit on vehicles in place. Many of the people who have been killed in downtown portland in the last decade were involved in collisions with people driving semi trucks or other large vehicles like garbage trucks. Perhaps a 5 ton weight limit on the street could eliminate some of the most dangerous types of interactions, right and left hook turns by large trucks. It will be so nice to bring my kids from the waterfront to the easy entrance of Washington Park (near burnside and 25th?) the whole route on a Greenway! I wish we would have done this when Sam Adams was mayor. Looks like a wonderful improvement. Seems to me that maybe just going with a full-on woonerf might achieve similar objectives and be easier for everyone involved. The gauntlet of one-ways and curbs serves the purpose, but just seems overly complicated (and might lead to frustrated driver problems). But either way, I can’t wait! Very nice! That’s the bridge design I was pushing for at the PAC meeting. Happy to see they went with the mountable curb. The article is mistaken. 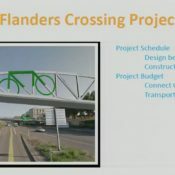 The bridge cross-section is going to be flat, and PBOT will install green thermoplastic to denote where bikes should go. breakfast on the flander’s bridge! I would agree on all of the above except "Equity" & "Affordability". Far to many areas of Portland need basic active transportation infrastructure and I believe the most basic needs, benefiting the most people, should be more of a priority. Kind of like prioritizing replacement of the hood star on your Mercedes Benz when your brakes are worn out….. This is the first time I’ve seen the existing bike infrastructure in Northwest compared to a Mercedes Benz. Maybe a 20 year old Mercedes-Benz. Sure it sounds prestigious, but the brakes are worn out, a couple of the windows get stuck when you roll them down, some weird electrical problem makes the taillights go out when you hit the brake pedal, the clock doesn’t work anymore, and the stereo cuts in and out when you go over bumps. So yeah, maybe that is a good bike infrastructure analogy. Awesome! 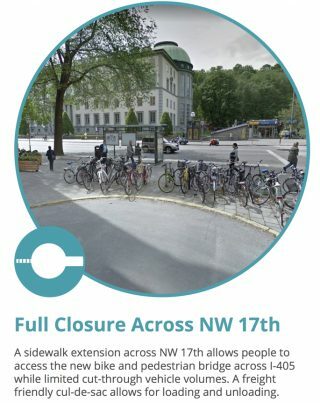 I’m glad to see the proposal for a full street closure on NW 17th. A huge amount of auto traffic coming off of the I-205 ramp currently uses NW 17th as a rat-runto access the Nob Hill neighborhood, because they are not allowed to turn right on Glisan at that freeway off-ramp light in order to head westbound on NW Glisan. I’m another fan of PBOT’s converging one way design. It’s woonerf-like. With my workplace on Flanders, I can’t wait for this project. One disappointment: It looks like the Naito/Front crossing is not part of the project. I hate the crossing of the railroad tracks at Naito/Front and Flanders and have hoped for a decade that something might be done about this. I know the railroad is tough to negotiate with and am guessing that that’s the hold-up. But the rest looks solid and the bridge over I-405 is fantastic. I really hope the signal priority will be at a biking pace on that whole stretch, without requiring any button-pushing or triggering a sensor! Although they are busy, I always ride on Glisan and Everett through there because you don’t have to stop at every block or dart across any streets without a signal. Really curious how they plan to to tie into Natio and the Waterfront. If it stops at NW 1st it seems like a bike boulevard to nowhere. I don’t even need to read their PR anymore to know that what they are proposing is both over-engineered and underwhelming. Most folks here seem quite happy with the solution. What would you change to make it better? Thanks for posting this update! The semi-diverter at 21st is great news, as previously there was no diversion planned west of 17th. The lack of westbound diversion between 12th and 14th is a major omission IMO, one that PBOT had originally planned to address but has changed for some reason. 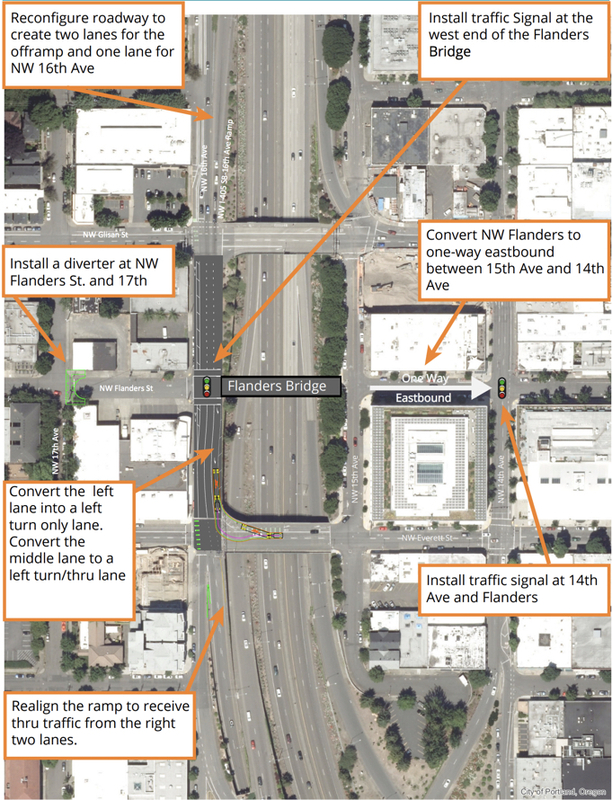 Drivers routinely use Flanders as a cut through to bypass congestion on Glisan to get to the freeway, and that would still be possible as this plan currently stands. Two huge thumbs up. I see they have a “Ramp To Steel Bridge” labeled on the overview document. Curious about that. The Steel Bridge does not have a lot of space for all the bikes and pedestrians crossing it right now. I dream of one day having multiple pedestrian/bike dedicated bridges across the river with silky smooth transitions to bikeways and greenways. Without any MAX lines or bus lines, mind you.